Floyd uses propane, but has the option of electric. 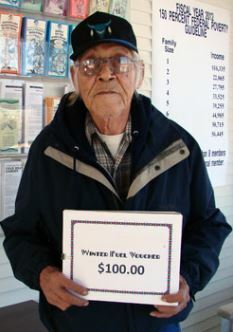 Meet Floyd, an Elder living in Montana who received a voucher for winter fuel. We recently had the pleasure of visiting with him. He recalled the worse winter was around 1963 or 1964. He said, “That was when the dam burst. The snow was under my arms and I’m 6’1”… but I’ve shrunk a little. It took 3 days to plow us out and 2 plows to do it.” They hadn’t seen that type of winter in a long time and hoped not to any time soon. Floyd uses propane heat, but has the option of electric. Two winters ago, he had to use electric heat because he ran out of propane. With the forecast showing that natural gas will be 15% higher than in previous years, this could be an issue again this winter. Floyd has had health issues like bronchitis and pneumonia that require medication, and that compound the cold and blistery Rocky mountain winter weather. “The second time I caught double pneumonia. I spent 10 days in the hospital,” he added. Balanced budgets are always important, but according to the Energy Information Administration forecasts, “heating costs are likely to significantly rise this winter, due primarily to much colder weather rather than higher prices” according to a government report. The Northern Plains Reservation Aid™ (NPRA) Program’s Winter Fuel Service may not be able to prevent bronchitis, but it can certainly help keep Floyd’s house warmer when he needs it. We are happy to partner with the Blackfeet LIHEAP office — and our generous donors and Program Partners — to help Elders like Floyd have a more comfortable winter! Thank you for helping make this service possible!